The 2.5 storey intermediate terrace house has a very prominent context from the existing houses next to it and around the neighborhood, which is a near semi-circular balcony in the middle of the 2nd floor sticking out of the facade. Taking that as a reference, we redesign the new house front facade to incorporate the balcony as required by the Client but recessed it into the house to offer a better shading from the sun and rain. At the same time, consistent to the series of terrace houses design language develop, we have designed a symmetrical facade with the entrance to the house from the side, not visible from the street. The side wall of the house is then cladded with granite stone for a good looking texture and expensive look to the house. Internally, there is a triple volume void separating physically but connecting visually all rooms with the dining area right below it. 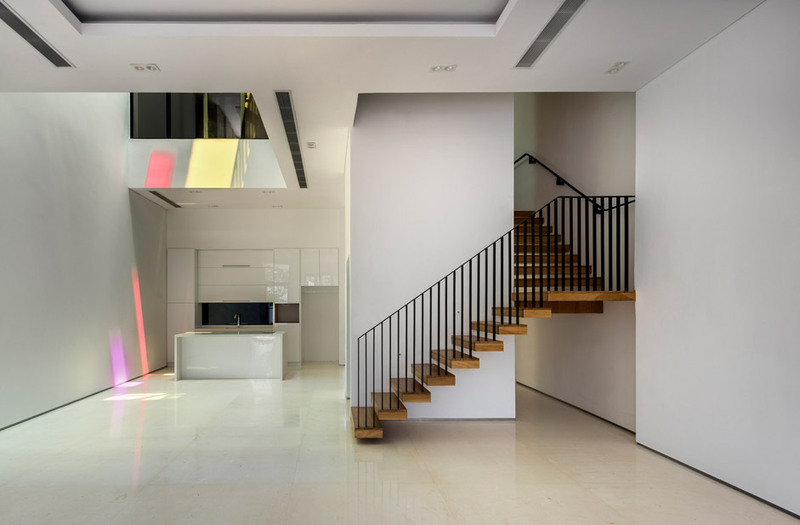 Bathed in colored glasses, the skylight becomes highly animated and inhabitants inside the house will be able to enjoy a space that moves phenomenally with the time throughout the day.